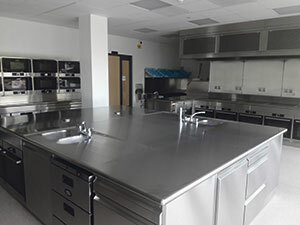 ScoMac has recently completed the prestigious Aldi test kitchen at its new Atherstone facility. 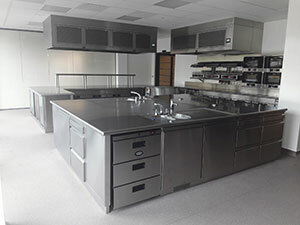 ScoMac provided the complete stainless steel kitchen facilities incorporating both domestic and commercial appliances into its bespoke fabrication, featuring fully sound deadened radius rolled edge tops and soft close cupboards and drawers specifically designed and manufactured to the exacting standards of the Aldi chef team. The main kitchen also sports full extraction and supply ventilation systems. Each canopy features ultraviolet odour control incorporated into the design, thereby treating the full system downstream. Touch screen controls built into the canopy plenum provide the operator with a user-friendly interface, all designed and provided by ScoMac. And it doesn’t end there… ScoMac is also leading the way in specifying innovative food sampling displays. Located in the adjacent sampling rooms, ScoMac provided and installed 40 flush fitting hot and refrigerated cold plates, each with remote plant to ensure even heat dissipation. This new CE approved technology allows the same display pad to achieve hot and cold food safe display temperatures thereby saving space. Yet, at the same time, offering the flexibility to meet the many varied food choices on offer to their valued clients. ScoMac worked closely with building contractor DSP Construction offering careful attentive project management every step of the way. ScoMac’s efforts didn’t go unnoticed as they were pleased to receive a letter of commendation from Aldi’s UK property director, Mike Clarke. This entry was posted in News and tagged Catering, Hospitality. Bookmark the permalink.